Folami Geter of Supernatural, LLC is the owner and operator of Lamb’s Bread Vegan Café in Columbia, SC. Folami is a lifelong vegan who inherited Lamb’s Bread from her father. The café has served the community for over a decade and was recently named one of Food Network’s Top 20 Vegan Restaurants. However, the storefront they occupied was rented, and Folami wanted Lamb’s Bread to have a permanent home in the Main Street community. Folami began working with Columbia’s City Office of Business Opportunity as part of the City’s North Main Street area redevelopment efforts. The Office of Business Opportunity wanted to support Folami’s goals for her business but knew they needed a lending partner in order to obtain financing for Lamb’s Bread’s new location. South Carolina Community Loan Fund saw an opportunity to help a woman- and minority-owned business secure its place in a community in the midst of a revitalization by joining this partnership and financing the purchase of Lamb’s Bread’s new building. SCCLF and Folami worked together for more than a year to complete the underwriting process and building purchase. “Folami is a case study in persistent entrepreneurship,” notes SCCLF Chief Lending Officer James Chatfield. 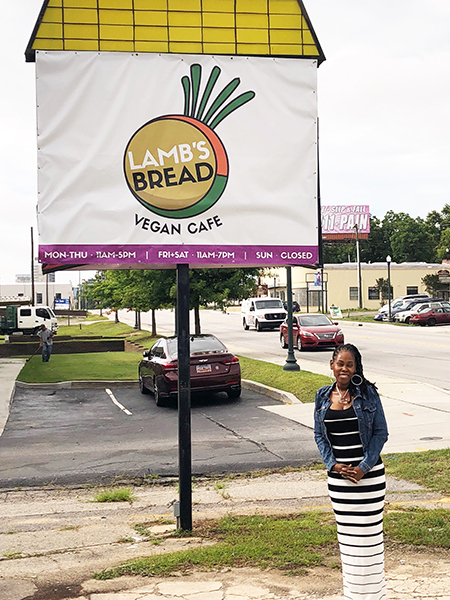 Lamb’s Bread Vegan Café will be a cornerstone of the City of Columbia’s revitalization efforts while continuing to provide healthy dining options for the surrounding community. In addition, Lamb’s Bread will continue to source their ingredients locally as often as possible, which helps to sustain and support the local food economy. Lamb’s Bread currently provides three jobs to members of the community and plans to double their staff within the next two years. Further, as a result of this loan and of Folami’s tenacity, this community business will benefit from the long term stability and financial security provided by property ownership. Note: As of August 1, 2018, Lamb’s Bread Vegan Café has become A Peace of Soul Vegan Kitchen. Congratulations to our friends at A Peace of Soul on this exciting re-brand!